While the holidays are largely about religion, family, friends and gifts, we also tend to make food a centerpiece of our celebrations. But since reviewing cookbooks isn’t that interesting, here are other books with a food theme to make your holiday eating more thoughtful and literary. I was going to begin by talking about several mystery series in which the detective is involved with food or cooking, but after a little research, I have been stunned at the number of series in this vein. There are dozens of series: Amanda Flowers’ “Amish Candy Shop Mysteries,” JoAnna Carl’s “Chocoholic Mysteries,” Joanne Fluke’s “Hannah Swensen Mysteries,” Tina Kashian’s “Kebab Kitchen Mysteries,” the list goes on. And on. For pages. Each of these “culinary mysteries” features a protagonist with a passion for (and sometimes career-creating) food, who regularly stumbles upon crime scenes, and uses their intellect and nosiness/curiosity to solve the case. These books also often have clever, punny titles like “Pies and Prejudice” or “The Long Quiche Goodbye.” And after the villain is caught, you can often complete the experience by trying out a sample recipe included in the book. 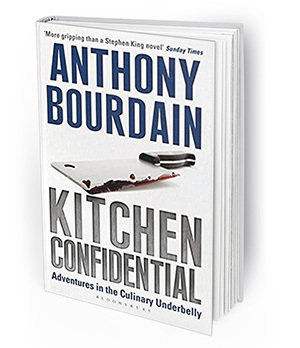 Many mourned the recent death of celebrity chef Anthony Bourdain, but his introduction to the masses was his tell-all book about the sordid life of haute cuisine, “Kitchen Confidential: Adventures in the Culinary Underbelly.” The book helped sell the narrative of the “bad boy” celebrity chef, but also highlighted Bourdain’s passion, humor, and gift for storytelling. In later years, Bourdain also penned a handful of graphic novels, including “Get Jiro!” (about a dystopian Los Angeles ruled by influential chefs) and “Hungry Ghosts” (a series of short horror stories that focus on food). “Hungry Ghosts” also contains original recipes by Bourdain. And some books are about how food brings people together. 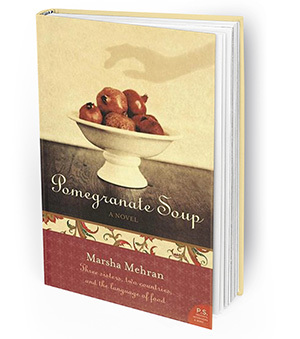 Marsha Mehran’s “Pomegranate Soup” is about a trio of sisters who are looking for a home after fleeing Iran’s Islamic Revolution. They settle in a small village in Ireland, and begin rebuilding their lives by opening a traditional Persian cafe in the center of town. Some welcome the sisters with open arms, while others see them as aliens and foreigners to drive away. 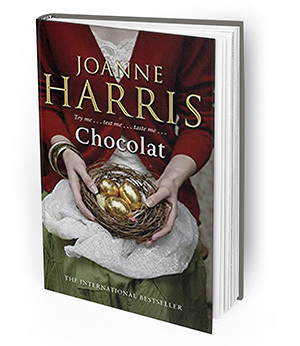 Touching similar themes is the classic “Chocolat” by Joanne Harris. Vianne Rocher moves to a small town in France and opens a sweet shop of her own. Her confections tempt the prim populace, and many see both her liberated lifestyle and the food she serves as threats to community morals. 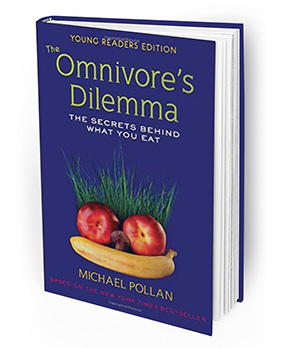 In both books, the power of food engenders connection, and conflicts turn to friendships and satisfied bellies. Come celebrate the holidays with us at the La Mesa Library, with our family Winter Wonderland program Dec. 15, noon–1 p.m., featuring cookie decorating and a puppet show. Or come to our Second Saturday Concert, featuring “San Diego’s Accordion Sweethearts,” The Polka Dots, Dec. 8 at 1 p.m.
—Jake Sexton is a librarian at the La Mesa branch of the San Diego County Library. Call the library at 619-469-2151, visit in person at 8074 Allison Ave., or visit online at sdcl.org. © 2019 Mission Valley News. San Diego Community News Network (SDCNN).